Blackmagic Atem Television Studio Switcher | On Event Production Co. The Blackmagic Atem Television Studio is a powerful video switcher in a compact format. It can be used for many applications such as camera mixing and conferences with laptop inputs. The Atem has 6 inputs and 2 media players to select from. The 6 inputs can be made up form a combination of 4x HDMI and 4x SDI. By default, we recommend running the Atem with 3 Laptops (Main/Backup/VT) with 3 Cameras (L/C/R). The media player inputs can be used for images such as a holding slides or test slides and are useful to switch too quickly if needed. The Atem comes complete with a laptop to run the control software. This is very simple to use and has an auto button for switching, you can set the fade time and type of transition on here too. It is also where you load the images into the media players. You can also control the inputs’ colour/gain parameters here. The usual resolution we run the Atem at is 1080i, but it can go down to 720p or less (16:9 and 4:3 PAL/NTSC) if required too. It has a customisable Multiview Output which is sent to the 17” Black Magic Design screen showing all the inputs available and the program out. It then has a HDMI Output for the main output, a HDMI > DVI adapter is supplied for this. It has an SDI output for the program and preview outputs too giving you more options. 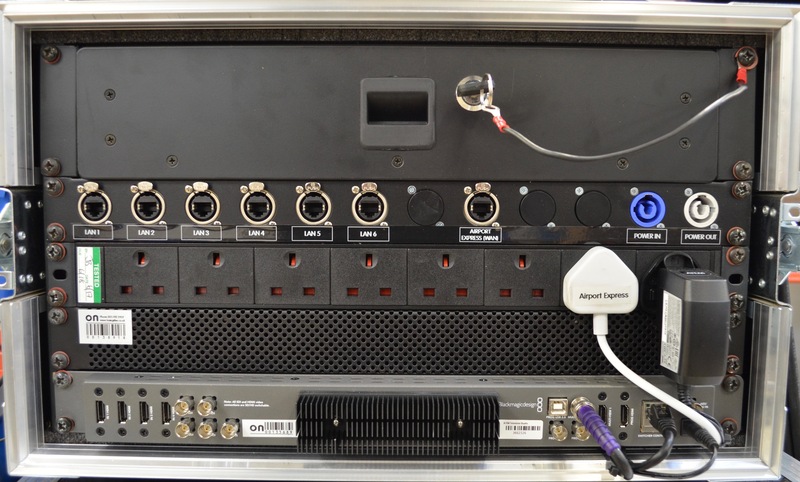 The rack includes a custom panel matching the design on all our other video racks. It allows for power in and out of the rack, and data from the built-in switch inside. You are also able to network all your laptops in video control together to easily transfer files and connect to the internet through the WAN socket on the rack.